Hints from Herman — Welcome to MrBatten.com! It appears that I have a very good immune system. I attribute this to a job I once held for something like 11 years, which involved an idiotic amount of travel, primarily air travel. Just imagine averaging somewhere between 4 and 6 flights per week, trapped in an aluminum tube with an atmosphere that is approximately 85% recirculated air. Someone sneezes in 36D, and within minutes, those viruses and germs are coming out of the air vent over 2B. Or imagine a hotel room, prepared by a cleaning staff that just wants to get this room cleaned quickly, but not necessarily thoroughly. Or imagine what goes on in the kitchens of the restaurants you dine in. Better yet, let's not think too much about that. I suspect that I have been exposed to most of the germs and viruses that afflict the general population. My survival tells me that my immune system, probably because of all this exposure, is in pretty good shape. I seldom get sick, and when I do, it is seldom very bad. Thus have I avoided doctors. Unfortunately, a good immune system cannot cure a cataract, and in order to have the surgery next month, I needed a pre-surgery physical exam this month. That happened Tuesday. The result was shocking. They ran an EKG. An EKG checks for heart disease, which presupposes that one has a heart. Apparently, I do. That will come as a great shock to a number of present and former students of mine, as well as to a few ex-girlfriends. And my heart is ready for cataract surgery. The one physical ailment that has bugged me for the last two weeks is the set of gashes on my arm, courtesy of Lucy, the Devil Puppy. One day she came a-flying through the air, claws extended, and landed on my left arm. That resulted in some serious bleeding. It told me that it was time to trim her claws, which I did. But the clippers left the trimmed edges of her claws fairly sharp, so I used a trick I learned with Ronnie: I sanded them down with a Dremel Tool. Then it hit me: the Dremel Tool is but one of those time-saving hints I've learned over the years. Why not share these hints with you? Remember the newspaper column “Hints from Heloise”? Somehow “Hints from George” just doesn't have that certain ring to it. “Hints from Herman” sounds better. Clothes washing: Back in the 1960s, the madras clothing available seemed to have poorly fixed dyes. Wash them, and watch them run. There is no way that one would wash madras with any other item of clothing, for fear of coloring the other clothing. Those days, my friends, are gone. The past 50 years have seen advances by dye and fixative chemists, and I really haven't noticed any great running of colors. So, stop sorting whites and colors into separate piles. Save the Earth! Cut your water usage doing laundry in half! Wash your whites and colors together! Exception: if you plan to bleach your whites, then do those clothes separately. Cleaning neck ties: Every tie that I've sent off to a dry cleaner has been ruined, primarily because silk doesn't stand up very well to the high pressure used in pressing at these establishments. I learned to place my neckties in the upper rack of a dishwasher, and hang them up promptly when the cleaning cycle is completed. Vacuum cleaners: If a man owns a Shop Vac, he does not need to own a vacuum cleaner. This one needs no explanation. Blood stains and other water-based tough-to-remove stains: Hydrogen peroxide is a great cleaning agent. It can remove blood stains and other difficult stains (such as a George's Gourmet Pepper Sauce stain) from clothing, without bleaching the underlying fabric. Try it on any stain of the sort. Yes, hydrogen peroxide is a bleach, but it is a relatively weak one. 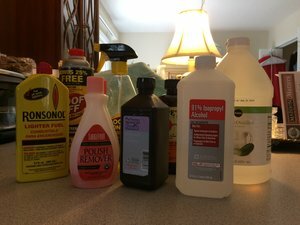 General stain removal: I keep a series of solvents under the kitchen sink, which I use to remove stains and stickies. Here they are: Zippo or charcoal lighter fluid; toluene; Goo Gone; acetone (nail polish remover); ethyl acetate (non-acetone nail polish remover); isopropyl alcohol; hydrogen peroxide; ammonia; distilled vinegar; Hoppe's No. 9 Gun Bore Cleaner. The trick is finding which solvent works on which stain or stickie. It helps if you know a little bit about the problem. For example, if I'm dealing with a grease spot, I will try the lighter fluid or toluene first, followed by Hoppe's. For removing an adhesive, I generally start with isopropyl alcohol or ammonia.